Apologies in advance if this is incoherent. The best way to describe my current state is ‘sloth-like’. I might pop back and edit this later but I wanted to get in touch with you all now. It’s now a month until the start of M.E. 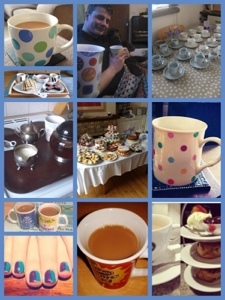 Awareness week which means it’s a month until my charity tea party ‘Blue Sunday’. Some of you may remember last years event, which was the first. (Blue Sunday 2013.) 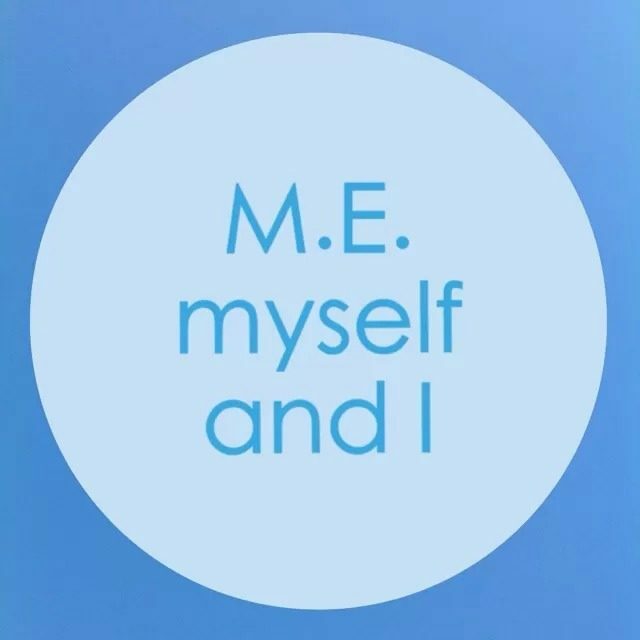 After a couple of years of illness I finally felt well enough to try and do something to raise awareness of Myalgic Encephalomyelitis. We decided a marathon was out of the question… because I no longer had a pair of decent trainers. Instead we opted for a cake sale style shindig. So my extended family and closest friends to joined me for Afternoon Tea at home. The idea for the virtual side of the party came about because lots of my friends lived too far away or were too poorly to travel, or both. This way they could stay in their pjs and even in bed of they wanted to, and follow the tea party updates that I was posting online. Just like last year, I have set up an events page on Facebook but I hope that this year we can expand things to include Twitter and Instagram by using the hashtag #BlueSunday. That’s the plan anyway! For those who can, or want to, there is a JustGiving page for donations. All I would ask for is the price you’d expect to pay for a pot of tea and a slice of cake in your local coffee shop. Any donations are so very gratefully received and all those a who donate and attend will be entered into a prize draw. So far I have two prices and am looking for other kind souls who are willing to donate others. Last year I forked out for prizes myself but funds just won’t allow that this year I’m afraid. 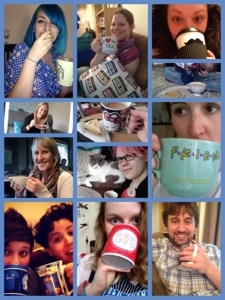 Many of you are asking how a virtual tea party actually works. I have no idea really is the honest answer. This is only my second year of attempting it. I’m still rather poorly so it really isn’t going to be an all singing all dancing extravaganza but it’s an opportunity to meet new friends online, and to eat dangerous amounts of cake. What more could you want for a Sunday afternoon in May? All you need is an Internet connection and cake. Lots of cake.